A wedge of green melon rested on the plate between the scallops. Grilled to juicy softness outside, the melon was lukewarm, firm in the middle, and dusted with lemon-scented sumac and chiles en polvo. Beneath scattered young herbs, a slab of bacon was singed on the surface but melty within, oozing fat onto the ripe fruit. We sank forks into the shellfish, briny and sweet and cool on the inside. Bites of the melon exploded in sunshiny sweetness, boosted with porky salt. And so we ate, alternating bites: bacon and melon, melon and fish, fish and bacon, and melon and fish. It was early on a Tuesday, but Wild Roots' three dining rooms were full. Reservations can be hard to come by at this restaurant, which opened in Royalton in May. With my party's varied schedules, it took nearly three weeks to land a table. Everything about this is unlikely. The space, isolated on a drive-by stretch of Route 14, benefits from neither foot traffic nor surrounding commerce. The old brick building, though charming, has struggled to keep a kitchen open since Jean and Gary Curley closed their inn and restaurant more than a decade ago. The food, sourced almost entirely within a 50-mile radius, is more formal — and somewhat pricier — than at other restaurants in town. And Jayne Sully Cole and her husband, Josh Walker, have never owned, or even managed, a food business before. When chef Peter Varkonyi ditched a chef de cuisine post at Denver's buzzy Beast + Bottle in October 2016, his friends called it "career suicide," he recalled. Months earlier, the Denver Post had named him one of five rising-star chefs. Young, ambitious and gifted with a rare talent, he might be cooking for Daniel Boulud or Danny Meyer or Dan Barber in New York City, making good money and a name for himself. Instead, he's cooking mostly solo at the old coach stop, unable to find enough experienced line cooks, or a pastry chef, to staff his kitchen. Behind the bar, Wild Roots' walls are painted John Deere green. In the bathroom, they're electric navy blue and splotchy in the manner of DIY paint jobs. On a dining room table, a tiny tulip and a broomy wisp of crabgrass in an old medicine bottle reflects a minimalist approach to table décor. Their scrappy elegance seems to ask, Who says weeds can't be beautiful? 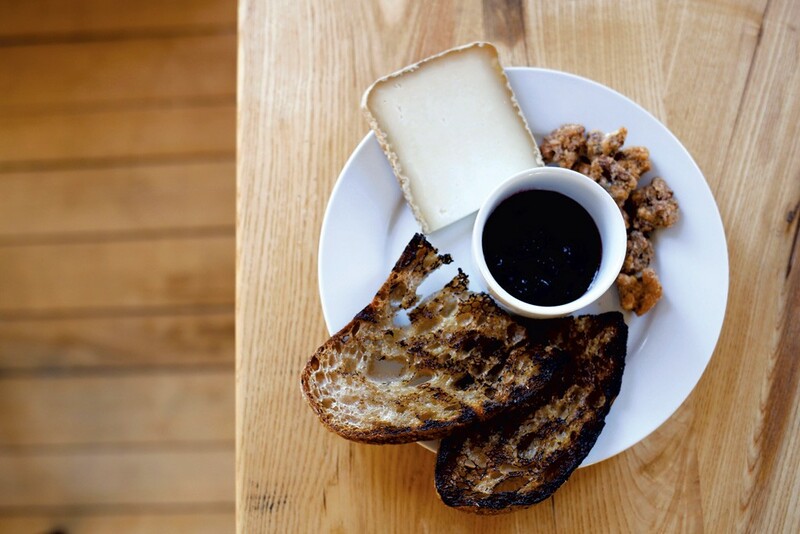 In this space, with its slab-wood tables and worn pine floors, Varkonyi, Sully Cole and the rest of their team are serving some of the finest food you'll find anywhere in Vermont right now. 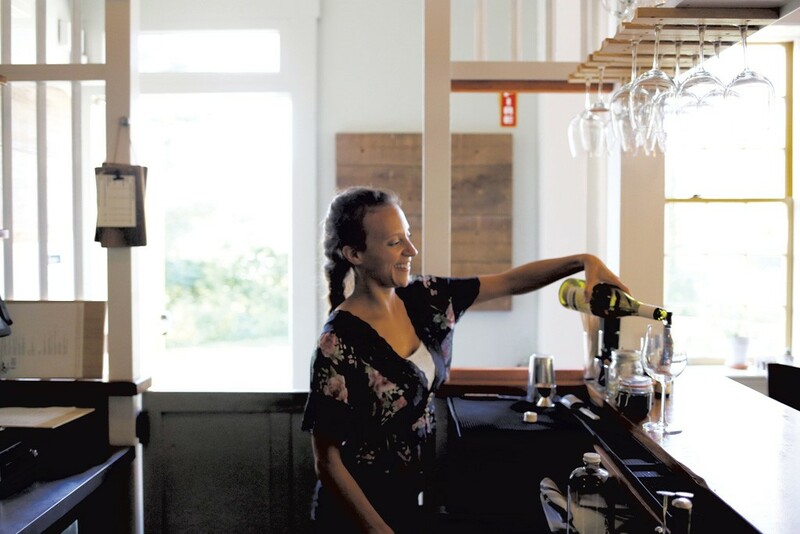 Sully Cole is a level-two sommelier who stocks her cellar with micro-vintages from natural, biodynamic and organic vineyards. Her bartenders blend cocktails with local spirits and pour just a handful of Vermont beers and ciders. On a warm evening, a brisk, pale-pink rosé from Alto Adige smelled of minerals and tasted of a windswept alpine hayfield dotted with flowers. My friend's barely sweet Mint to Bee cocktail was spiked with Barr Hill Vodka, honey, lime and mint, like a dry vodka mojito. A cooler night might begin with a pour of Shacksbury's Dorset cider or with a warming, round-bodied red. And the bar's sparkling sodas, layered with fruit and herbs courtesy of mixers by Sumptuous Syrups of Vermont, have the power to make drinking virgin feel festive. The menu has four sections: meats and cheeses ($8 to $12, all local or made in-house); plates "to share" ($10 to $15 and generously portioned); entrée-style "suppers" ($20 to $30); and sides ($6 to $8). If you tend to disregard a server's predinner spiel, heed those here when you're advised that the menu is designed for sharing. You can make an excellent meal of small plates and sides, with maybe an entrée or two split among several people. If you can, consider submitting to a three-hour supper. Service transpires at a relaxed pace that invites lingering, and you might as well give yourself time to enjoy it. Varkonyi is a New England Culinary Institute grad with a background in high-end cookery, and his execution of incontrovertible menu staples shows serious reverence for correct technique. One night, I had a jar of rosy-pink duck liver, blended with schmaltz and a splash of light wine, which spread so smoothly on grilled bread that it could bring chicken fat back into vogue. You could cut the musk with a dilly bean nibble or a bit of striped pickled beet, fragrant with cardamom — but no one would blame you for slathering on the pâté thick and unadorned. On another visit, a pile of blistery shishito peppers dressed with oil, salt and lime reminded me of why the dish is a new classic from coast to coast. A bowl of hunky beef tartare, dry-aged to a gentle funk, was tossed with puréed avocado and presented with a dollop of buttercup hollandaise. It was a nice break from the layered hockey-puck format that some chefs still embrace when arranging raw meat with other ingredients. If many Wild Roots dishes seem to riff on familiar ideas, Varkonyi's cooking is most magical when it takes lessons from the classics without caving to convention. One night, a seared steak with grilled new potatoes and kale was excellent, but it tasted like what I call a "consolation dish" — solid but uninspired, included for palates that prefer the immediately familiar. Several weeks later, a plate of smoke-tinged baba ghanoush, smooth as buttercream and overlaid with salted, soft-roasted strips of eggplant, pickled peppers and ample sesame seeds, was accessible to anyone who's eaten Greek or Turkish food. But the tenor of the dish was entirely the chef's own, and the plate's marriage of familiar and unusual made it more fun to eat than your average mash-y crock of eggplant. If interpretative dishes like these represent the creative heart of the restaurant, they also hint at Varkonyi and Sully Cole's larger mission to spin Vermont's abundant world-class ingredients into elegant, expressive food where burgers and fried pub fare are the norm. If "elegant" can read as code for "occasion restaurant" in a rural area like Royalton, Wild Roots' executive team is betting that the White River Valley is ready for something new. "There is no BS surrounding the idea that [this restaurant] is and continues to be a gamble," Varkonyi told Seven Days via phone. "But there's a level of arrogance you have to have to say any restaurant is going to work. And we genuinely believe that when people say they're tired of tavern-pub-English fare, it reflects a real demand for something different." This time of year, that change might manifest as a bowl of gnudi (petite ricotta dumplings) tossed with creamed corn and brown butter and veggies that pop with just-picked freshness. On another night, "something different" meant curled octopus tentacles, fork-tender and charred smoky on the grill, with bread crumbs for crunch, diced pickle for acid and shavings of lardo so finely cured we at first mistook them for cheese. If you order several dishes, you may notice the same ingredients again and again — that's a function of cooking to the micro-season, Varkonyi said. 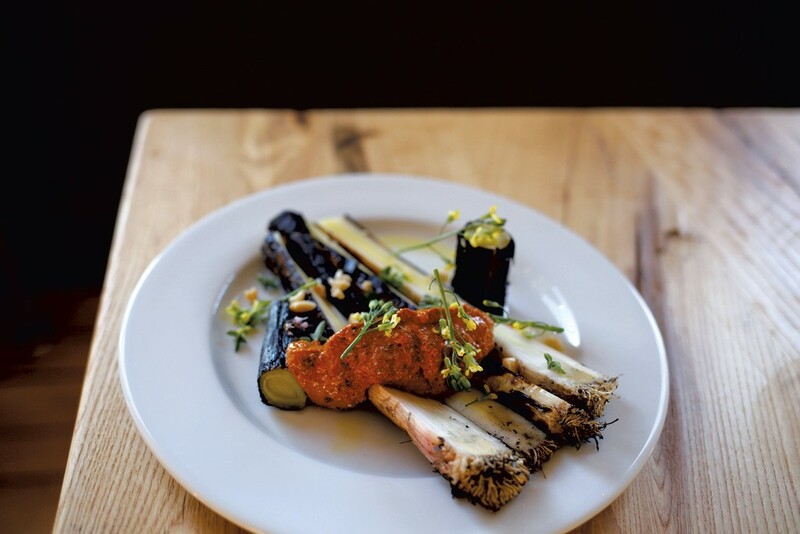 As you eat, a plate of ash-smoked carrots connects with eggplant baba via smoke and cumin; pickled peppers might bind the eggplant and the octopus. All of this conspires to create meals with a consistent timbre that evokes the season through a chef's eyes. If one could discern a message in the food, it might be: OK, so here's what we eat now. Outside in the parking lot, you might find yourself feeling drawn to a giant old apple tree, branches weighted with fruit in the cool, dewy night. Particularly after a dessert of simple but beautiful blueberry crisp, or a crock of molten chocolate cake — dark with cocoa and smooth as pudding — or a rocks glass stacked three scoops high with house-churned strawberry ice cream. And if you feel the urge to stuff your pockets with apples, take comfort in knowing the people inside won't begrudge you a bite of autumn's native fruit. Crisp and cleansing and dripping with juice, that fruit will sustain you on the drive home. The original print version of this article was headlined "Rustic Elegance"